Description: This report provides a summary of all the information of one client’s case, including service file, case profile, and the individual profile. Biannuals can also be included in their entirety. Go to the client’s case page (by clicking on the client’s case name from “My Case Load” or in the search page). Click the “Reports” heading from the right-hand menu bar. Click the link for “Complete Case Profile Report”. A box should appear with the title “Parameters”. Under “Case”, type the name of the case of which you would like a summary (usually the client’s last name”. 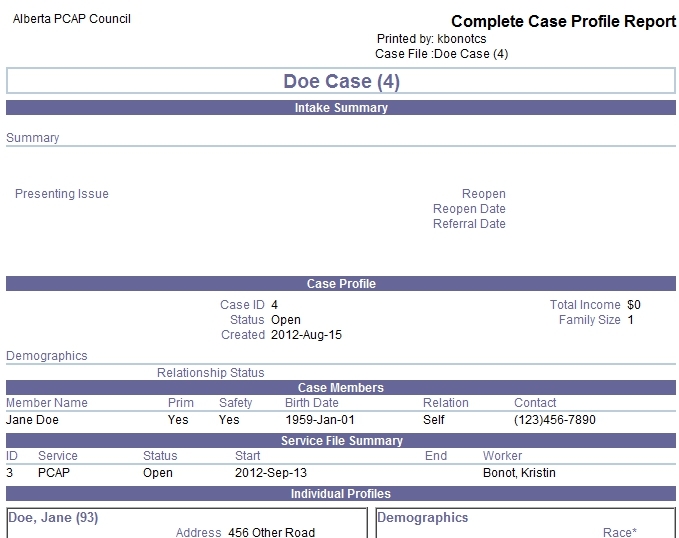 Select “Individual Profile” if you would like to include demographic information about your client. Leave “Individual Profile Documents” unchecked. If you would like all of the client’s biannuals to be included in the report, leave “Documents” checked. Otherwise, uncheck “documents”. If you have tracked the client’s referrals on Penelope, they will be included in the report if “Referrals” is checked. If there are any notes on the client’s Service File, they will be included in the report if “Service File Notes” is checked. Typically, a client does not have any notes on their Service File, so leaving this box checked has no effect. Leave “Service File” selected under “Sort by”. Leave “PCAP” checked under “Service File” if you would like to include information about the PCAP service file. This entry was posted in Reports and tagged case profile, report on August 30, 2013 by kbonot.